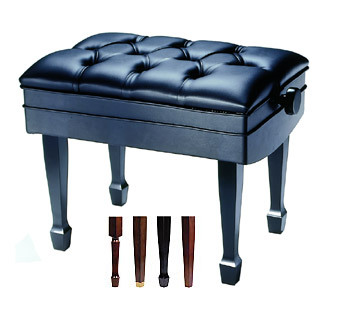 Classic Artist Bench - Free Shipping! is rated 4.33 out of 5 based on 52 ratings. You'll always be in perfect position as long as you are seated on our bench. This traditional artist bench adjusts from 18.5"-21" high and is richly upholstered with an elegant folded tufting and two welt borders. The comfortably supportive tufted benchtop measures 21.5" x 15.5". Our bench comes standard with a satin finish and matching vinyl upholstery. Your choice of finish and leg styles. Options include leather upholstery and high-gloss finish. For special leg lengths please call customer service.